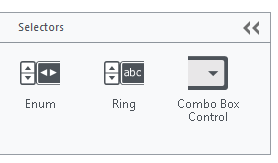 Use a ring when you want your user interface to provide a list of choices that represent numeric values. The ring control is a numeric input that allows the user to choose from a list of meaningful, human-readable values instead of numeric values. If the logic of your program prefers numeric values to string values, you should use a ring. Use an enum when you want your user interface to provide a list of choices associated with an enumerated data type. If you want your program to deal with a fixed set of constants instead of arbitrary numeric data, you should use an enum. You want to present the user with a list of shipping speed options for the item they want to order. 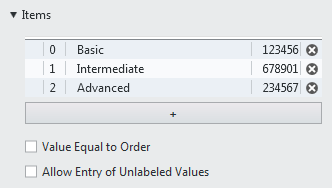 The numeric values assigned to each of the options are automatically defined and cannot be edited. If the logic of your program requires string values rather than numeric values, you should use a combo box. How Do I Assign Specific Values to the Selector Controls? On the Item tab, in the Items section, assign and arrange specific values as desired. On the Item tab, in the Items section, select Allow Entry of Unlabeled Values. As a user enters text into a combo box with typing enabled, the combo box suggests the closest match to the user's input.